Above: Henry Brandon as Dr. Fu Manchu in Drums of Fu Manchu (Republic, 1940). Tall, aristocratically handsome, and possessed of a fine speaking voice, Henry Brandon was a frequent leading man in stage productions, and could conceivably have played leading men on screen as well. However, Brandon’s screen presence had a decidedly menacing edge, and he effectively exploited said menace in most of his film appearances, including his four serial turns. Brandon’s impressive appearance and scornfully self-assured bearing gave his serial villains something of the air of a fallen angel; his Lucifer-like persona was further augmented by his arrogant but compelling voice, which he could use to either threaten or manipulate his adversaries. Serial fans remember Brandon first and foremost for his excellent portrayal of the notorious Dr. Fu Manchu, but his other chapterplay characterizations, though less colorful, were equally sinister. Henry Brandon was born Heinrich Kleinbach in Berlin, Germany. He came to America as a child, and decided on an acting career at a young age. When he was seventeen, he enrolled in the prestigious Pasadena Playhouse’s acting school, and was performing in the Playhouse’s stage productions by the time he was twenty. At the age of 22, he made an impressive movie debut as the villainous Silas Barnaby in the 1934 Laurel and Hardy classic, Babes in Toyland, delivering a hilarious, exaggeratedly evil performance worthy of a much more experienced actor. However, after Toyland, Brandon settled back into a stage career for the next couple of years. He re-entered films in 1936, playing small but important parts in big-budget films like Paramount’s Trail of the Lonesome Pine, and David Selznick’s Garden of Allah, as well as a much larger role in Jungle Jim (Universal, 1936), his first serial. In Jungle Jim, Brandon played the “Cobra,” a wanted British criminal who had fled to the African jungle. Before the serial began, he had convinced the “Lion Goddess” (Betty Jane Rhodes), an heiress shipwrecked in the jungle as a small child, that he was her father. When famed guide “Jungle” Jim Bradley (Grant Withers) showed up to return the girl to civilization, the Cobra, who was ruling the natives through the now-grown Goddess, feared the destruction of his comfortable setup. He also (wrongly) suspected Jim of being a government man sent to arrest him, and did his best to do away with the intruder while maintaining a precarious hold on the natives. Jungle Jim was an exciting serial with good exotic trappings and a large and interesting cast. Brandon had to share screen time with several strong performers, including silent-film veterans Evelyn Brent and Bryant Washburn, but he easily held his own and made the most of the Cobra’s moments in the spotlight; his haughty aggressiveness and commanding manner made his character’s influence over the natives and the Lion Goddess quite credible. Above: Henry Brandon is about to knock out William Royle in Jungle Jim (Universal, 1936). Above: Al Bridge, Evelyn Brent, and Henry Brandon watch as natives close in on Raymond Hatton and Grant Withers in Jungle Jim. Shortly after Jungle Jim’s release, Brandon played another major role in Universal’s 1937 serial, Secret Agent X-9. This time, he played Blackstone, the urbane lieutenant of the international jewel thief Victor Brenda. Blackstone relayed the unseen Brenda’s orders to the rest of the criminal’s gang, continually threatening them with his mysterious leader’s wrath when they failed. Brenda’s attempt to steal the Belgravian Crown Jewels while they were being exhibited in the United States went awry, and Blackstone and Brenda’s other followers found themselves vying with Federal Agent Dexter (Scott Kolk) to recover the missing gems. Blackstone was revealed as Brenda himself late in the serial, which explained why such an intelligent villain was seemingly content to obey someone else’s orders. Although the plot (which had Brenda regularly disguise as Belgravian agent Baron Karsten, played by Monte Blue) frequently forced Brandon off-screen in X-9, he was ideal in the role of the duplicitous master criminal; he maintained an air of smug superiority both before and after his unmasking as Brenda, and preserved an unflappable calm as he executed his daring schemes. Above: A disguised Scott Kolk grapples with Henry Brandon as Henry Hunter comes to Kolk’s aid in Secret Agent X-9 (Universal, 1937). Above: Henry Brandon thinks he has his hands on the Belgravian Crown Jewels in this scene from Secret Agent X-9. Brandon’s accomplices are (from left to right) Leonard Lord, Lynn Gilbert, and Jack Cheatham. Brandon now began working more extensively in feature films, mostly playing bits or small character parts in films like Warner Brothers’ Black Legion and Paramount’s Beau Geste. In 1939 he made his third and final Universal serial, Buck Rogers. For a change, he was the lead henchman instead of the chief villain. As Captain Laska, one of the followers of 25th-century world dictator Killer Kane (Anthony Warde), he spearheaded Kane’s attempts to suppress the Hidden City Exiles, a band of holdouts who opposed Kane’s rule. 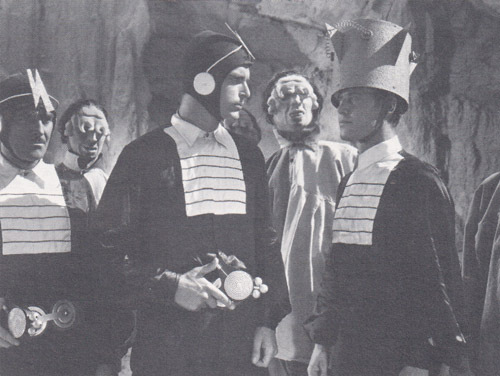 Both sides sought an alliance with the planet Saturn, but despite Laska’s efforts to sway the Saturnians to the side of his “Leader”–first by smooth-talking diplomatic means, then by threats of destruction–hero Buck Rogers (Buster Crabbe) convinced the neutral planet to come to the aid of the Hidden City. Although Warde’s Killer Kane was the leading heavy in Buck Rogers, Brandon served as the hero’s chief antagonist for the first two-thirds of the cliffhanger, improvising many villainous strategies on his own and receiving more screen time than Warde. Above: Henry Brandon re-establishes control over a rogue “human robot” (Stanley Price) in Buck Rogers (Universal, 1939). Wheeler Oakman is on the far left, and several of the alien Zuggs are looking on. Above: Henry Brandon holds Saturnian soldiers at bay to prevent them from coming to the aid of Buck Rogers. Dave Sharpe is second from left. Following a few more film assignments, including a notable role as a sympathetic gunfighter in George O’Brien’s B-western Marshal of Mesa City, Brandon auditioned for the lead in Republic’s 1939 serial Zorro’s Fighting Legion. This attempt to end his typecasting as a villain backfired, however; Republic directors William Witney and John English didn’t “see” him as Zorro, but decided he would be ideal for the role of the arch-criminal Fu Manchu in an upcoming Republic cliffhanger. Thus, Drums of Fu Manchu (Republic, 1940), saw Brandon in his fourth, final, and greatest turn as a serial villain; his screen-dominating portrayal of Fu Manchu was closer to the character created by Sax Rohmer than any other film rendition. Brandon gave his Fu a cold, passionless, cooly self-confident demeanor, occasionally flying into a dry rage but also showing flashes of grim humor. He altered his natural voice to a startling extent, affecting a high-pitched, sonorously hypnotic tone with only a very slight Chinese accent. Drums’ plot dealt with Fu Manchu’s attempts to secure the scepter of Genghis Khan, the key to his plans for ruling the world–and the attempts of British agent Sir Denis Nayland Smith (William Royle) and American archeologist Allan Parker (Robert Kellard) to stop him. Brandon appropriately received top billing in Drums, and was allowed to survive uncaptured, albeit defeated, in the final chapter. Drums of Fu Manchu proved to be Brandon’s last cliffhanger, and it would have been hard for him to find a better vehicle to cap his serial career. Above: Fu Manchu (Henry Brandon) and his daughter Fah Lo Suee (Gloria Franklin) in Drums of Fu Manchu (Republic, 1940). Above: Henry Brandon watches coldly as his “Dacoits,” or henchmen, force Tom Chatterton (second from left) into a torture device in Drums of Fu Manchu. The fanged Dacoit in the center is John Merton; Fu’s other prisoner is George Cleveland. Republic planned to feature Brandon as the mysterious Dr. Satan in their serial of the same name, but the plan was scrapped when Brandon’s commitment to another film project interfered (the Dr. Satan role went to Eduardo Ciannelli instead). Plans for a Fu Manchu sequel were also dropped when China became an official US ally following Pearl Harbor. Brandon played a few more movie roles–among them meaty villainous parts in the Republic B-westerns Under Texas Skies and Bad Man of Deadwood— before military service interrupted his acting career in 1943. After his discharge, he re-entered Hollywood in 1947, and enjoyed a busy career as a character actor, in both movies and TV shows, for the next forty years, while also appearing frequently on the “legitimate” stage. One of his most notable roles during this period was the role of the Indian chief “Scar,” whose raid sets John Wayne’s relentless quest in motion in John Ford’s The Searchers (1956). He played other Indians in shows like Wagon Train and Lawman, as well as Hawaiians, Frenchmen, ancient Egyptians, and a multiplicity of other “exotics” in films like Wake of the Red Witch, Vera Cruz, and The Ten Commandments. His non-exotic roles were also numerous, among them appearances on shows as varied as The Twilight Zone, Maverick, Walt Disney Presents, Kolchak, and Murder She Wrote. His career, which had slowed down considerably in the 1980s, concluded with a role in an atrocious low-budget 1989 fantasy film called Wizards of the Lost Kingdom II; in 1990, he passed away in Los Angeles. Years earlier, he had been sought out by fans of his serials, had conversed freely with them on the subject of his cliffhanger work, and had attended at least one screening of Drums of Fu Manchu, where he surprised and delighted fans by duplicating his old Fu voice for their amusement. The diabolical arrogance and dark, twisted charisma that Henry Brandon gave to Fu Manchu was also present to varying degrees in the other serial heavies he played, all of whom seemed as intelligent and commanding as they were ruthlessly evil. However, it was definitely Drums of Fu Manchu that firmly established him as one of the serial genre’s greatest arch-fiends, a position he has held in the esteem of fans ever since that chapterplay’s original release. Above: Henry Brandon, backed by his Dacoits in Drums of Fu Manchu (Republic, 1940). Acknowledgements: Joe Collura’s article/interview, “Henry Brandon: Fu Manchu and Other Memorable Characters,” published in issue #15 of Cliffhanger magazine (1991) provided me with the biographical information in this article. Also adding to my above post about having a Christmas party in July, so we then had a 4th of July celebration in December. I am pleased to announce that Richard S. Greene and I wrote a definitive book on Henry Brandon (published by Bearmanor Media). Many new revelations, photos and reviews to include an extensive list of his stage successes.